Momentum Cyber, the premier trusted advisor to the cybersecurity industry, today revealed the most significant trends that will drive strategic activity in the cybersecurity industry in 2019 and will be prevalent themes at the annual RSA Conference (RSAC) starting today in San Francisco. Last week, Momentum Cyber published its second annual Cybersecurity Almanac for 2019 – the most comprehensive review of all strategic transactions and the firm’s proprietary insights on the industry. 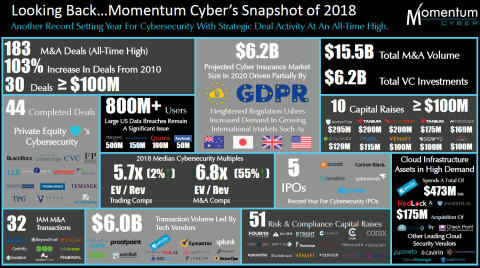 The 800-page Cybersecurity Almanac chronicles the key trends which made 2018 a record-breaking year for the industry including $15.5 billion in M&A volume and $6.2 billion in VC investments and lays out Momentum’s key predictions for 2019. The report is comprised of an in-depth analysis of over 3,500 cybersecurity companies across the globe, strategic deal activity including IPOs, mergers and acquisitions, venture capital and private equity financings, and the market impact of news and events. For more information on these events, please contact Dino Boukouris, [email protected]. Momentum Cyber is the premier trusted advisor to the cybersecurity industry providing bespoke high-impact advice combined with tailored, senior-level access. The firm was founded by world-class operators and advisors and caters to the unique needs of both earlier stage Founders, CEOs, & Boards as well as the complexity of later stage & public companies throughout their lifecycle – Incubation to Exit. Headquartered in San Francisco with operations globally, the founding team has closed over 250 transactions totaling over $250 billion in value. Momentum Cybersecurity Group, LLC conducts its M&A advisory services as an M&A Broker as defined by the SEC.